I have to thank Dr. Seuss for this recipe. For the longest time we couldn’t have eggs, and my oldest would not even touch them, but as his belly healed we were finally able to tolerate them. He actually loves eggs now. This pass Christmas we were really into Dr. Seuss and spent a lovely time reading all his books. 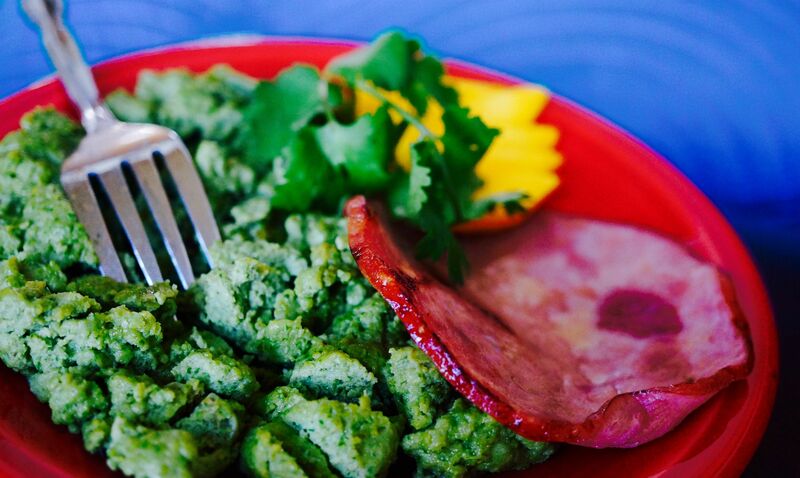 One of his favorites was “Green Eggs and Ham”. I realized that is one of the greatest stories ever written for a picky eater! It’s all about not wanting to try something just to try it in the end and really enjoy it! Because my oldest would not go for anything green but really enjoyed the that story, my husband had the brilliant idea of creating this recipe. We brought the book over, presented this dish and it worked like magic! For the very first time, our son ate something GREEN!!!!!!!!!! It was a moment I will never forget. These days we make many versions of this recipe! But the best part of this story is the fact that this recipe has opened up his diet to many other green foods, such as our “Detoxiful” Hulk leafy green juice recipe, salads and green vegetables. It’s a truly a dream come true in our house hold! This recipe has lots of healing ingredients and it's super nutritious! Butter/Ghee contains vitamin K2 (which is essential for the body's metabolism of vitamin D) and healthy saturated fats. It's one of the most nutritions foods you can add to your diet. Check out my post on the benefits of saturated fats called Bacon + Egg Yolks + Butter = Bad food for the Heart? Not so fast! In a blender add eggs, salt, cilantro, broccoli, green onions and garlic in that order. Blend on high until all ingredients are pureed (approximately 30 seconds). In a skillet heat 1 Tbsp of butter in medium heat. Remove ham from pan and set heat to low. Add the remaining tbsp of butter. Add egg mixture and scramble until eggs firm up and scramble as desired.